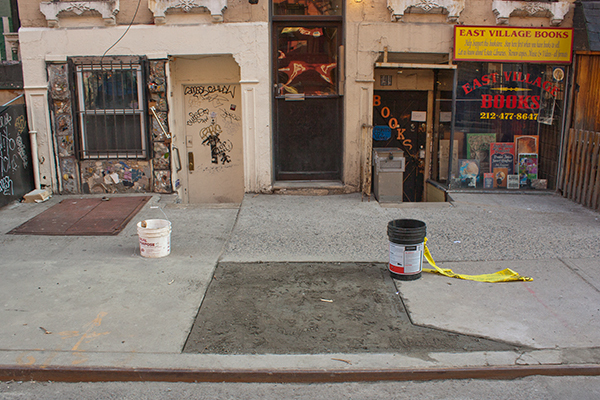 When I first took this picture, I wanted to write about the messed up sidewalk polygon, but the more I looked at it, the more I saw, and I realized: this could easily be the most perfect East Village picture ever! What makes this the most perfect East Village picture, you ask? It's got everything: a messed-up sidewalk square; a sidewalk square than isn't even a square! ; two buckets that were meant to protect the wet cement — one that's partially on the cement, the other that's nowhere near it! ; broken caution tape; a hovel-like bookstore; a hovel-like basement apartment looking out onto cellar doors; and graffiti! And I've written about both of these places before: apartment on left; and East Village Books. Add that to the list… this is the East Village Today!